There is one thing that Jordan MUST bring to school with her every day. As in, life will end if she forgets it. It’s not her lunch or snack. She has approximately 10 pairs of sunglasses at home. She even has a special place by the front door to put her sunglasses. Right now? There is one pair in that cubby. There are also three pairs on her dresser, a pair on her desk, one in her bed, and several hidden throughout the house. Jordan is in the 5th grade. She’s 10. For 5 years I’ve told her: keep a pair in the car. Keep a pair in your backpack. Keep a pair in your desk. Does she? No. So guess what happened last Thursday? You probably guessed correctly: doomsday. And then I waited all day for the inevitable aftermath 3:30 would bring. This pie is not hard. It looks hard, but it’s not. Also, it’s apple, which is my favorite. It’s got lots of crust. And it’s ALL full of apple cider: the crust, the filling, and the topping. 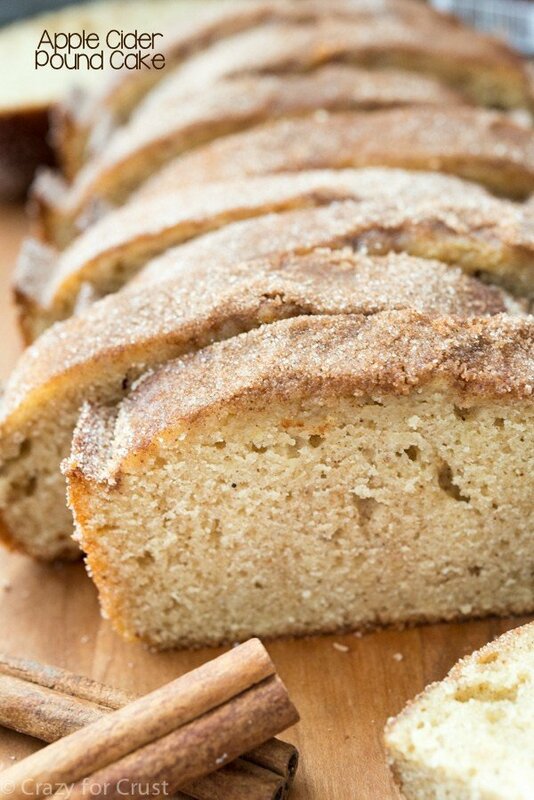 After making this Apple Cider Pound Cake, I still had some cider to use up. While we were in Apple Hill picking the apples I used in this pie, I also picked up a few of the local Apple Hill recipe books. One of them included a recipe for Apple Cider Pie, which cooked the apples in cider and made a syrup out of it for the filling in the pie. That intrigued me, because I always cook my apples for pie. 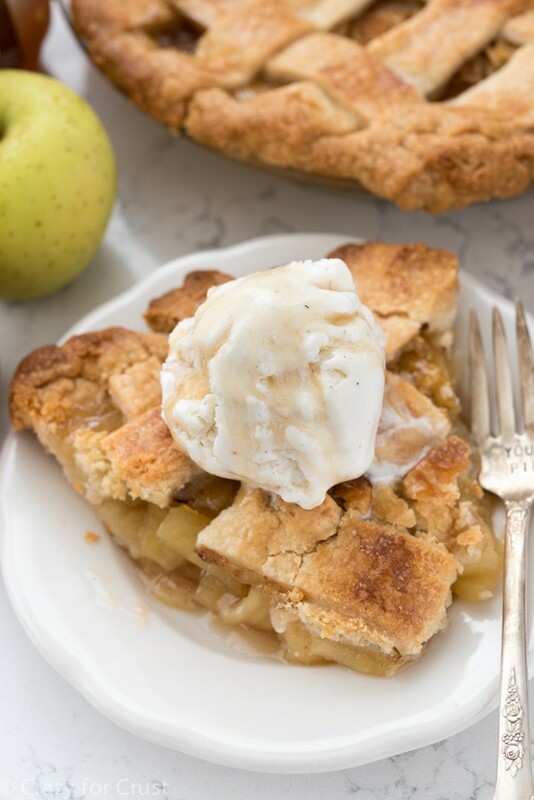 Then I got to thinking…could I add apple cider to my favorite all butter pie crust instead of using water? Guess what? YOU CAN. Have you ever made a vinegar or vodka pie crust? I have, although I’ve never posted them (yet). If you have made those kinds of crust you’ll know that they create an extremely flaky end product. The same goes with the cider. It adds a little sweetness and a lot of flaky to my pie crust recipe. THIS apple cider pie crust is now my favorite pie crust recipe. Now let’s talk about filling. Like I said, I always cook my apples before putting them in pie. I do not like a crunchy apple pie and par-boiling them is the only way I’ve ever found to make the apples the perfect tenderness. The Apple Cider Pie recipe I found called for cooking the apples in cider (like I would normally do in water). Once the apples are translucent, you remove them and reserve the cooking liquid. Then you add cornstarch and sugar to thicken it before adding it to the bottom crust. You guys, the filling is out of this world. This apple cider pie is now my favorite apple pie. Which, considering that my original recipe is why I started this blog, is a HUGE statement. I decided to top the pie with a lattice because (1) I’ve never made a two crust apple pie (I KNOW, RIGHT?) and (2) I thought it would look really pretty. You can skip the lattice and just make it a two crust pie if you want, or use the crumb mixture from my second favorite recipe. If you’ve never made a lattice before, it’s actually easy. Just use this lattice topped pie photo tutorial. If you need a visual making the pie crust, use this pie crust photo tutorial. If you need a visual making the lattice, use this lattice photo tutorial. The crust is more delicate than my normal recipe, because of the sugar in the apple cider. If it’s too soft to roll right away, you may need to chill it first. Once you’ve rolled it out, make sure to chill the crusts as directed before filling, topping, and baking. It’s very important the crust is COLD. The filling will thicken more as it cooks, but make sure that the pie is completely cool – even chilled – for the prettiest slicing. I was impatient, as you can see in the photos, and cut it before it was totally cool. Once I’d chilled it for a few hours and gone back for seconds, the filling was no longer leaky. However, it’s best served warm. With lots of ice cream and caramel. 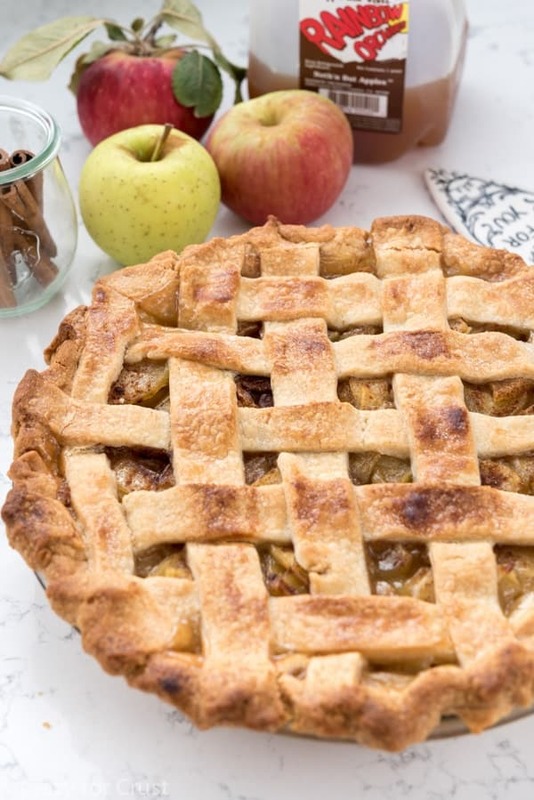 This Apple Cider Pie has apple cider in every bite! Adding apple cider to the pie crust makes it super flaky and the apple cider in the apples makes a sweet and delicious pie filling! Dice butter into cubes and put back in the refrigerator. Place flour and salt in a food processor and pulse until combined. Add butter and pulse until the butter is crumbly, just a few seconds. Add 3 tablespoons apple cider and run the food processor until the mixture starts to clump. Test the mixture with your fingers - is it crumbly or smooth? If it’s too smooth to form one full ball in the food processor add 1 teaspoon more of apple cider (up to 1 full tablespoon more) until the mixture forms a ball when the processor is running. Be careful not to add too much liquid. Place the apples and 1 1/2 cups of apple cider in a large skillet. Cover and cook over medium heat, stirring often, until the apples are almost translucent, about 5-7 minutes. Remove the apples and reserve the cooking liquid in the pan. Stir together granulated sugar, 1 tablespoon cornstarch, and salt. Stir in 2 tablespoons of cold apple cider. Add the cornstarch mixture to the hot apple liquid in the pan. Cook over medium-low heat until the mixture thickens, about 5 minutes. Add the butter and stir until melted. Remove from heat and add the apples back to the hot liquid. Let cool for 5-10 minutes. Remove crusts from the refrigerator. Slice the flat crust into 1” slices using a knife or pizza cutter. Sprinkle the brown sugar, cinnamon and remaining 1/2 teaspoon cornstarch in the bottom of the pie crust in the pie plate. Place the slightly cooled apples into the pie plate. Top the pie with the strips of dough in a lattice pattern. To create the lattice pattern (see this post for image tutorial): choose every other strip and place them on the pie crust with 1” gaps between them. Then take each remaining strip, starting at one end of the pie, and weave the strips over and under the strips that are on the pie in an alternating pattern. Brush the top of the pie with a little heavy whipping cream and sprinkle with granulated sugar. Place the pie on a cookie sheet and bake for 30-40 minutes until the crust is golden brown. Cool completely before cutting. Serve with ice cream or whipped cream and apple cider syrup. Good for you for being “the mom!” Stay strong! 🙂 This pie looks incredible, I so can’t wait to try it! 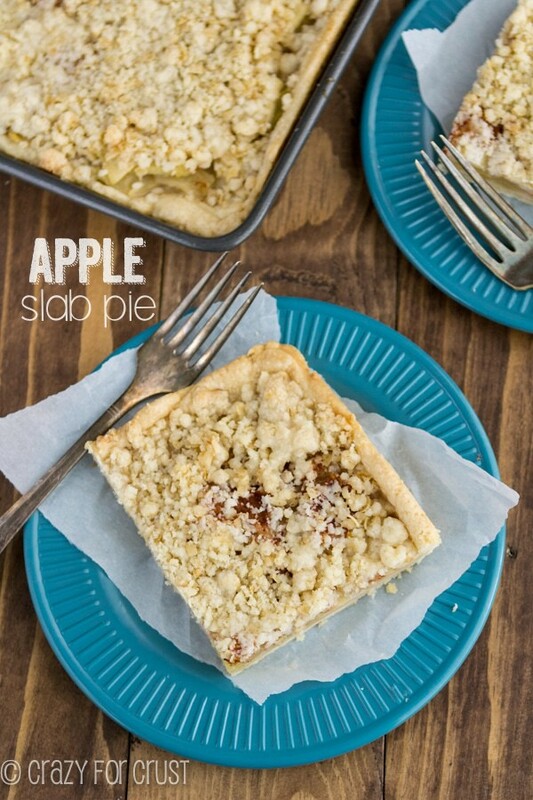 What a great idea to add apple cider to the crust! Can’t wait to try this! Poor girl! Being 10 is hard! 🙂 I remember I had an unhealthy attachment to my caboodle box with all my crayons and markers, if I forgot that it was basically a national disaster! I’m laughing hysterically about the similarities between your 10 year old daughter and my 36 year old husband! I can’t count how many sunglasses he has yet he always seems to be without a pair, gah! This pie (and wine) would most definitely soothe my sorrows after dealing with him! It’s SO gorgeous Dorothy! Apple cider in apple pie? Now that is just brilliant!! Your’s looks so beautiful! 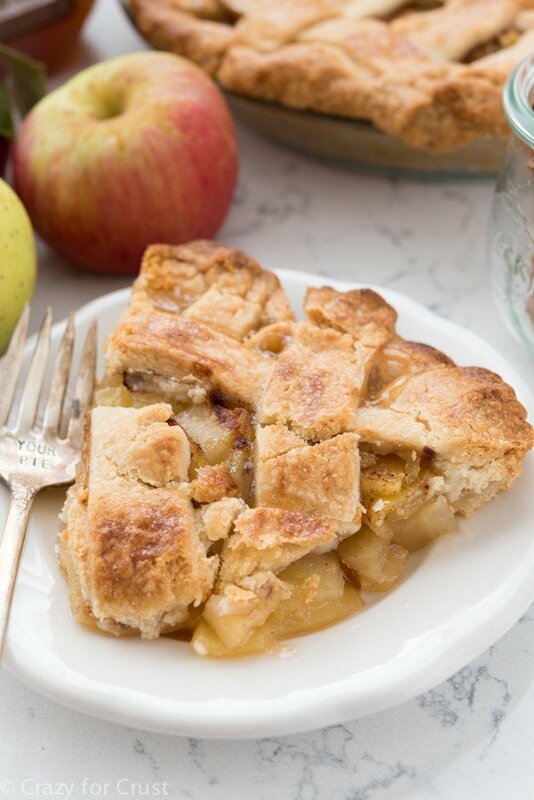 I am seriously in love with all the apple cider goodness in this pie! I have done other liquids in pie crust, but never thought about cider. Mind blown! While teaching your kids responsibility is very important, I encourage parents to filter their response to a situation with how they would like to be treated. I did not use going without a meal to teach a lesson. That will affect the rest of their school day in the ability to learn which is why they are there. And probably some friends shared to help out. So what has the child really learned from this lesson, is the question we as parents must ask ourselves. I made this pie yesterday and it is delicious. But nowhere in the recipe can I find where it tells you when to add the cinnamon. I put it in with the apples and cider in the skillet. If I am missing it in the directions, my apologies, but I read through it several times. The crust came together beautifully, no refrigeration needed and it rolled out perfectly. Everyone who has tried it says it is the best apple pie they have ever eaten, so thank you so much for the recipe. Does the bottom of the crust get soggy? I don’t find it soggy – it’s not crisp and crunchy though. I like my crusts more doughy/soft so that’s how this one is. You can make it more crunchy by cooking it at a higher temp for about 10 minutes, then lowering it to the recipe temperature when your first start baking it. 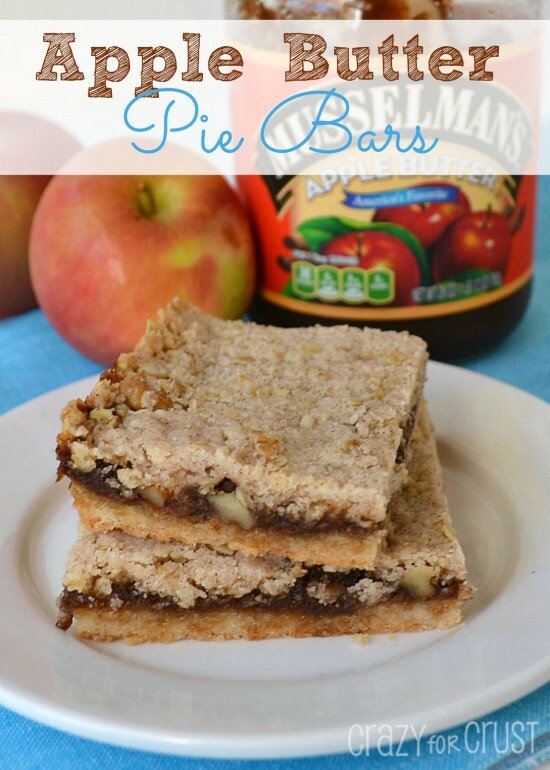 I’ve used vodka in pie crusts before, but using cider is genius! It sounds amazing. And the filling looks out of this world! Hi! I really wanted to make this pie for thanksgiving, but I don’t own a food processor 🙁 Is there any way I could make this without one (by using a blender or mixer, etc.)? You can make the crust by hand, no problem! I just use the food processor to make it easier. I made this for a friends birthday. I was told it tasted like a “67 year old Amish woman made this pie”!! So insanely good. I don’t even like apple pie and I love this! Thank you for this recipe! Totally forgot the brown sugar and cinnamon for the bottom of my pie crust. Is it ruined? Do I need to make another. Oye! !